HONG KONG—The official launch of the of the GFI HKFC Rugby 10’s tournament took place yesterday at Exchange Exhibition Hall at HK Exchange, with special guest Josh Lewsey MBE. Business man, explorer and England Rugby international Lewsey, completed a distinguished 10 year Rugby playing career with England from 1998 until 2008. In 2002 he was a member of the first England team to win the Hong Kong Sevens. He played in 13 Championship matches for England, winning all 13. He now works in Hong Kong and is pleased to support the HKFC Rugby 10s. Other attendees included sponsors’ representatives, HKFC committee members and organizers as well HKRFU officials, competing team members and coaches. 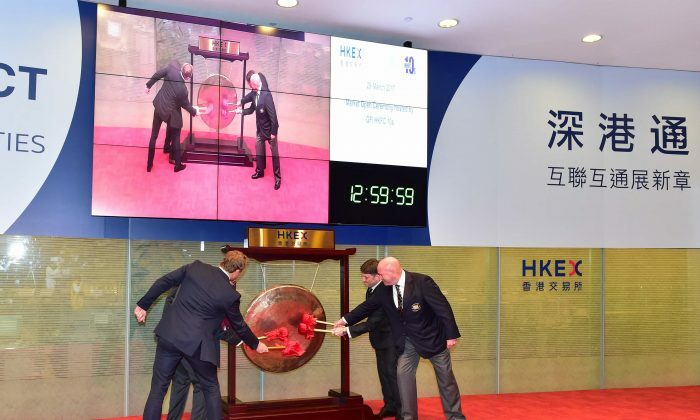 The Exchange Exhibition Hall is a rare setting for a sports-related event, the launch included a ceremonial banging of the gong to launch the 10’s as well as to open of the afternoon trading session. The HKFC 10’s is the traditional Hong Kong Sevens lead-in event which will take place at Hong Kong Football Club on Wednesday and Thursday April 5 and 6. Although well known as a social event, the Rugby is serious, and the tournament standard just gets better and better each year. Many famous Rugby names take part alongside current sevens specialist. Sixteen teams will be on display, split into 4 Pools for the initial round robin matches. Pool A is headed by The Penguins, last year’s winners, who will be pitted against Waterboys, Irish Vikings and Silver Dragons. Samurai International, last year’s runners up, will meet Scottish Exiles, UBB Gavkai and Gladiators in Pool B.
Asia Pacific Dragons are seeded 1 in Pool C, with Overseas Old Boys, King’s College and HKFC. And, Tradition head Pool D to play Classic Wallabies, Club Pyrenees and the East Africans. On completion of the Pool matches the top 2 teams move forward to Cup quarter finals and the bottom 2 of each Pool compete for the Bowl. Winners of the Cup quarter finals will progress to the Cup semi-finals whereas the losers will playoff for the Plate. Likewise for the Bowl quarter finals, where the winners move into Bowl semi-finals and the losers compete in the Shield. The Classic Wallabies will include many well-known names including legendary wing Wendell Sailor, 33-year-old scrumhalf Luke Burgess, Morgan Turinui and 2007 World Cup duo Stephen Hoiles and Adam Freier in their squad.